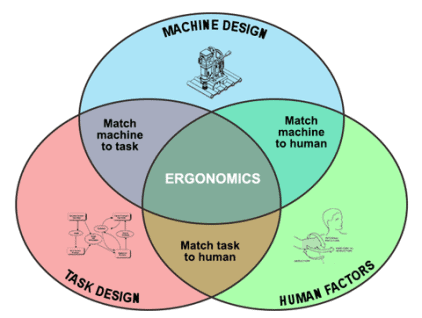 Ergonomics is the way you use your body to work and fitting the job or task to you to reduce your risk of injury. These musculoskeletal injuries develop slowly over time and occur in the soft tissues of your body like the nerves, tendons, muscles, ligaments and joints. Examples of these injuries are low back strain, carpal tunnel syndrome, and tendonitis. These injuries are called musculoskeletal disorders or MSDs. Unlike injuries from falls, electrocution, or other serious hazards, musculoskeletal disorders don’t seem very serious when they first show up. They start with minor discomfort in the early stages. These symptoms go away after a short break or at night when you don’t work. But returning to the same activity the next day brings back the symptoms. Your body can recover between these episodes of intense activity in the earlier stages when the symptoms are mild or moderate but eventually, your body won’t be able to recover to normal. Recognizing the problems in work tasks that cause these symptoms is the first step to eliminating them. There are 5 common ergonomic hazards that may occur in work activities. Repetition– involves doing the same task repeatedly that uses the same muscles over and over. High Force– using high muscle power during activities such as heavy lifting, pushing items or gripping tools. Awkward Postures– working with your body held in a poor position for a long time. Contact Stress– when pressure from an object is pushed on the soft body tissues (i.e. tool handle). Hand-Arm Vibration– vibration that enters the body from a power tools or equipment. One of these hazards performed over a long time can cause a problem but activities with more than one hazard can increase physical discomfort even more. First you must recognize the hazards in your work tasks. Think about tasks that are uncomfortable or difficult to perform. Try solutions (work technique, tools or equipment) to make the task easier to perform. Share your ideas and ask others for ideas.